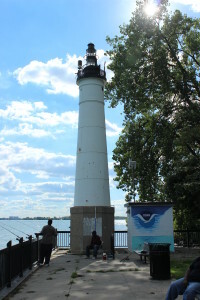 The Windmill Point Light in Detroit is definitely one of Michigan’s most noticeable or aesthetically pleasing lighthouses, but it marks an important stretch of the Detroit River near Belle Isle that is very busy with freighter traffic. 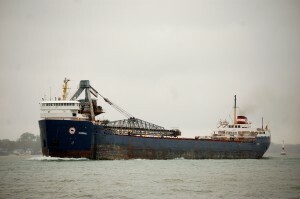 All traffic coming or going between Lake Huron and the St. Lawrence Seaway must pass this point. 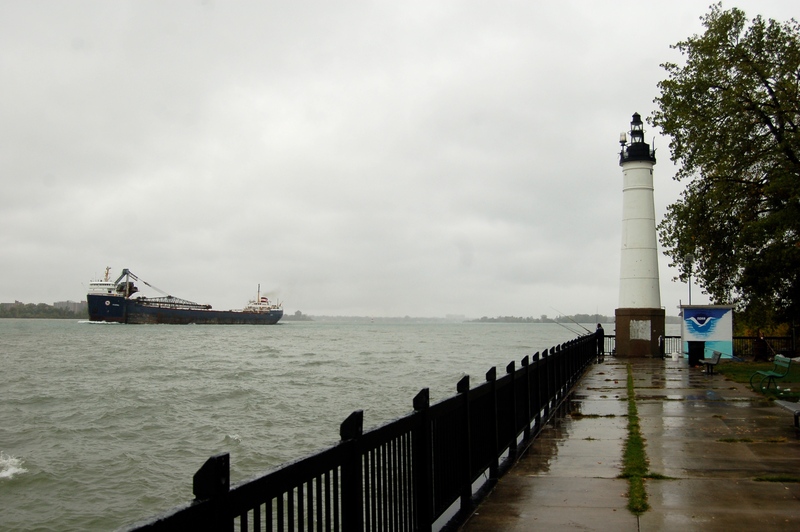 Windmill Point is located at the meeting point of Lake St. Clair and the Detroit River, as the shipping channel narrows for southbound vessel traffic. 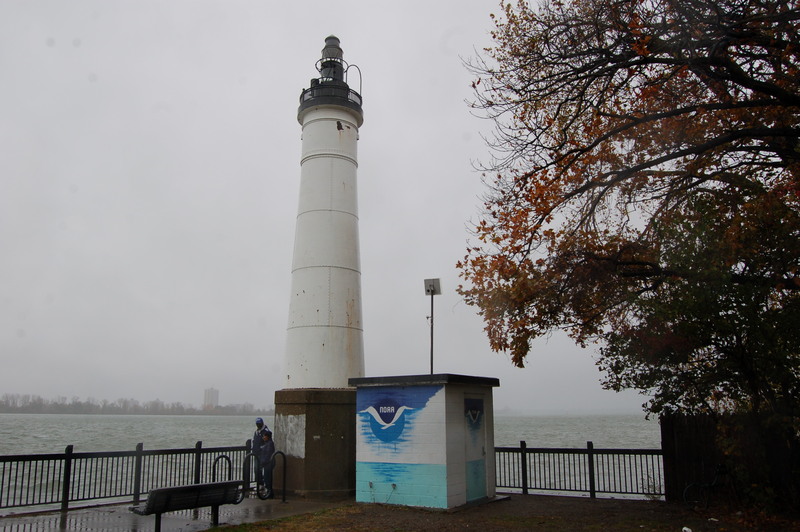 There was once a full lighthouse and keeper’s quarters located here, as well as a marine hospital. Looking at the surrounding area today it is hard to imagine such a sprawling, busy complex. 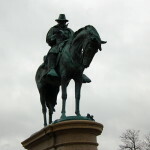 Lighthousefriends.com has a great collection of old photos of the full station and a lot more background history. The Windmill Point Light features an octagonal base made of concrete. Rising from that base is a cylindrical white steel-plate tower. 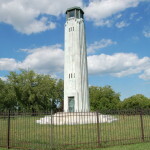 The top of the tower features a very basic black railing and lantern housing. 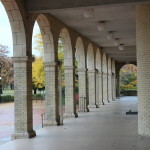 The full light is 45 feet tall. 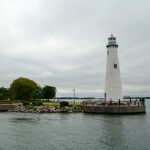 The William Livingstone Lighthouse is located a few miles to the south on Belle Isle. Today this area is known as Mariner Park, a popular fishing spot on the river and an excellent spot from which to watch freighters as they pass by. The Windmill Point Light was stop #2 on our list of lighthouse visited on the Ultimate Michigan Lighthouse Road Trip: Lower Peninsula. 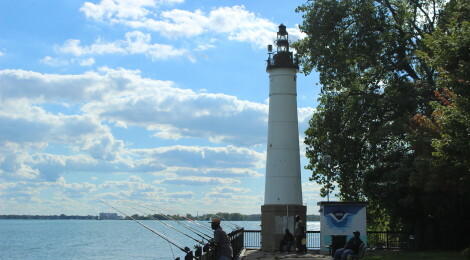 To get to the lighthouse (directions start near the Cobo Center), head east on E. Jefferson Ave. for roughly 6.5 miles, then turn right on Alter Rd. Take Alter Rd. towards the river, following it as it curves and becomes Riverside Blvd., until you see the sign for Mariner Park. 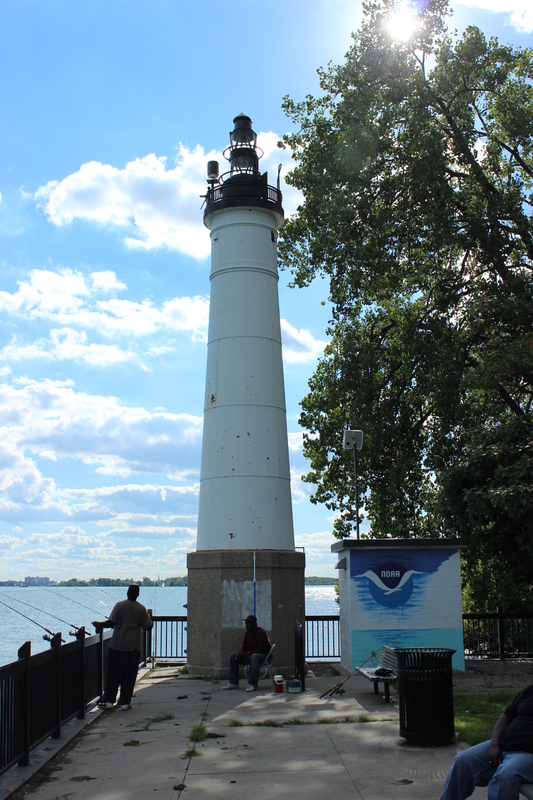 Pull into the park and find a parking spot – the lighthouse is at the far right side of the paved riverbank as you look at the river.